Do you have a ducted HVAC system? Air ducts are the pathways through which warm and cool air is distributed in your home. If you have duct work, it should be inspected and cleaned every several years. One reason is that air ducts can develop cracks and leaks through which heated and cooled air can escape, driving up utility bills. The other reason is that dirty air ducts are a major reason for polluted indoor air. What’s In My Duct Work? Can Dirty Ducts Cause Health Problems? Yes, especially for children, the elderly, and anyone with allergies, respiratory problems or asthma. Some sources claim that one out of six people have allergies caused by bacteria and other contaminants in their air ducts. According to the American College of Allergists, up to 50 percent of illnesses result from or are worsened by indoor air pollution. The Environmental Protection Agency states that indoor air can be 70 percent more polluted than the air outside, and most people spend up to 90 percent of their time indoors. 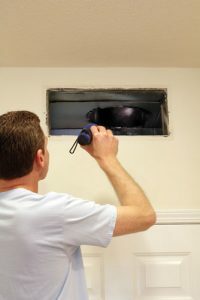 What’s Involved In Air Duct Cleaning? The NATE-Certified technicians at Cool Care Heating & Air perform duct cleaning service with high-tech tools designed to inspect, clean and repair dirty and damaged air ducts. Our team can remove pollutants like mold, pollen, dust, and other allergens in our thorough duct cleaning service. We can install UV lights to kill and prevent the growth of mold, and we’ll repair and seal any cracks or leaks. Not only does duct cleaning service have significant health benefits, duct work repair can reduce your energy costs and help your HVAC to function more efficiently. You’ll enjoy a cleaner Columbia, SC, home because your ducts will no longer blow dirt indoors. New homes benefit from air duct cleaning as well because, during construction, debris like small pieces of drywall, plaster, insulation, dust and wood can settle on and collect within the ductwork. If your clothes are hot and damp instead of dry, if there’s no lint on the lint screen, if clothes take longer to dry, or if the dryer becomes very hot, you probably need dryer vent cleaning. Vent cleaning helps the unit to operate more efficiently, lengthens the lifespan of your dryer, makes clothes dry faster and lowers utility bills. It also minimizes clothes dryer wear and tear, thereby reducing the possibility of a breakdown.